Are you getting tired of the rising gas prices? No one would blame you, it seems like every time you stop at a station to fill up, the price has gone up again! Prices are on the rise and there seems to be no end in sight. If you’re looking for some relief, then perhaps you should consider getting a hybrid car. In fact, there’s no better time than now as the 2019 Toyota Camry Hybrid just became available at Hesser Toyota in Janesville! The 2019 Toyota Camry Hybrid is more than just a hybrid version of the Toyota Camry, it offers its own unique style and substance to drivers while, of course, providing incredible efficiency! If you’re interested in the 2019 Toyota Camry Hybrid, you’ve come to the right place! We’re going to go through the specifications and features of the 2019 Toyota Camry Hybrid so that you know exactly what the hybrid has to offer! Let’s see what’s in store with the new 2019 Toyota Camry Hybrid! 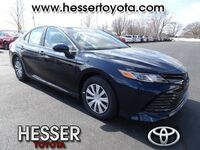 Test Drive the 2019 Toyota Camry Hybrid at Hesser Toyota in Janesville, Wisconsin, Today! We might as well start with what all drivers always want to know about a hybrid, its efficiency! The 2019 Toyota Camry Hybrid lives up to its name thanks to its dependable Hybrid Synergy Drive, use of lightweight materials and battery location. All these factors combine to give the 2019 Toyota Camry Hybrid an EPA-estimated 51 mpg city fuel economy and 53 mpg highway economy! Think about how much money you could save by getting 50 miles to the gallon! Plus, on the inside of the 2019 Toyota Camry Hybrid, drivers can use the 4-mode drive switch to activate the ECO Mode for even better efficiency! Drivers will also find the interior of the 2019 Camry Hybrid to be surprisingly spacious and comfortable. Just because it’s a hybrid, doesn’t mean you have to feel cramped inside! And, the leather-trimmed seats, rear-seat vents and heated front seats make sure everyone is always comfortable inside the 2019 Camry Hybrid! Plus, the 2019 Camry Hybrid offers some of the latest and most advanced technology features. Like, for instance, the Apple CarPlay functionality, which is a standard feature! Now, drivers can easily integrate their iPhone without having to pay more for the feature! Speaking of phones, the 2019 Camry Hybrid also offers the Wi-Fi Connect Powered by Verizon which can connect up to five devices. No more burning up your cellular data on the road! Want to learn more about the 2019 Toyota Camry Hybrid? Ready to get behind the wheel of one to try for yourself? Contact our staff at Hesser Toyota for more information or to schedule a test drive today!